Nestled in the foothills of the Julian Alps, this tiny resort town is set along a beautiful, mystical lake: Lake Bled. The town, and famously the lake, is in the Northwestern part of the small country of Slovenia. The center of the lake is a small island with a church settled on top. Climb the 99 steps to ring the wishing bell and watch your dreams come true! Overlooking the lake is a medieval castle that looks like something straight out of Dracula. While Bled may be small, it holds a lot of beauty and charm. Come for the famous Bled Cream Cake (Kremsnita) and stay for the incredible views of the lake and the Alps in the distance. I highly recommend going to Confectionary Zima (Slaščičarna Zima) for the cream cake. It’s arguably the best place in town and they have so many other types of pastries and deserts there. There are places to stay within the town, but if you’re looking for a more authentic stay, check out some of the Airbnb’s around the area. If you can book it, there is a beautiful “Fairytale” Cottage just outside the town up a few miles of winding roads and lush forests. The views from the front door are incredible and it’s quite peaceful. The cabin is two stories, and if you’re over 6 feet you’ll have to duck through parts of the cottage, but it’s very cozy and the Host, Urska is very polite and accommodating. 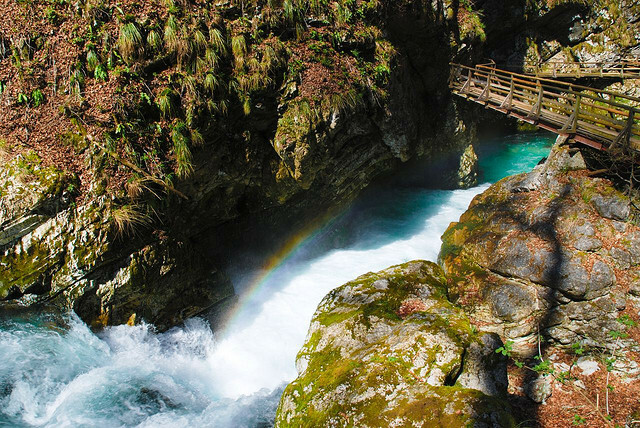 Not too far from the cottage is the well known Vintgar Gorge, with a wooden walkway that criss-crosses the Radovna River. Walk through the stunning scenery to see waterfalls and pools. You shouldn’t need more than a few days to experience all that Bled has to offer. The views are unreal and it’s an incredible place to see!